I think it’s funny that I learned to make salsa in Paris- out of pure necessity, really. Ever since leaving for college, one of the reasons I find myself regularly returning back to sunny Santa Fe is for the unmatched northern-style New Mexican food – warm flour tortillas, chunky green chili sauce, cheese tamales wrapped and steamed in corn husks… and, of course, the world’s most cheerful tomato salsa. When you grow up on this fresh local fare, your life just isn’t the same without it. 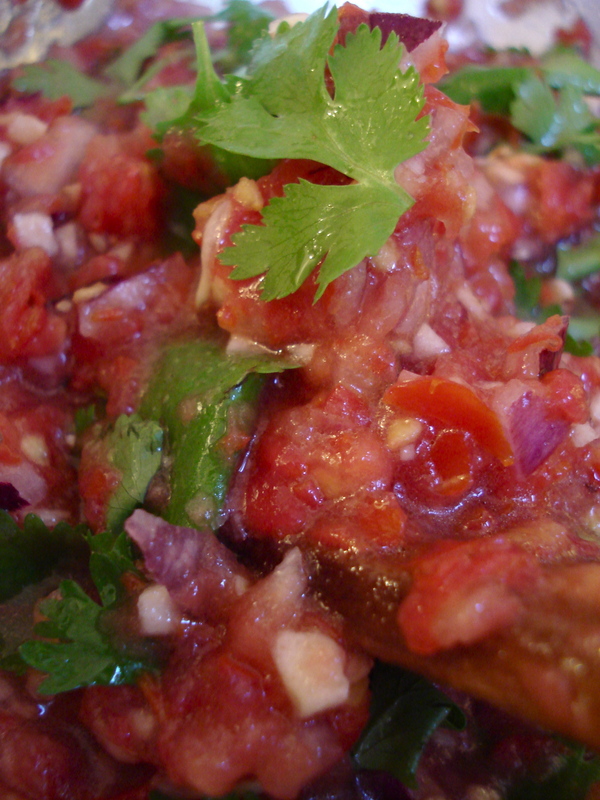 Thus, the reason I taught myself to make this tomato salsa in our tiny kitchen in Paris. Fortunately, we have a bigger kitchen now, but when I first tried it a few years ago, we had neither a countertop nor an appropriate sieve. It took me hours to chop up all the ingredients, strain out the extra liquid, and try to add spice without… well… any spice. Since then, I’ve simplified my approach- a fine sieve and admitting I wouldn’t have exactly the same ingredients as in Santa Fe helped. This recipe, which I made in about 30 minutes the other day, is based on traditional New Mexican salsa, but uses ingredients that are very easy to find in Paris! 1. Mince the garlic and onions. Set aside. 2. Gently mix the tomatoes in a blender. Don’t smash them too much! Just until they are the right size – small chunks. 3. Strain the extra juice from the tomatoes through a fine sieve (set aside for use in another recipe, so you don’t waste it). You may leave some liquid of course, but you want the chunks to dominate. 4. Add tomatoes, garlic and onions in a bowl and combine with the remaining ingredients to taste. I add the cilantro last, but lots of it! Be careful – disappears quickly next to a bowl of tortilla chips. This entry was posted in Recipes (All), Recipes (Gluten-free), Recipes (Vegan) and tagged chili, santa fe, sauces, vegetables. Bookmark the permalink.